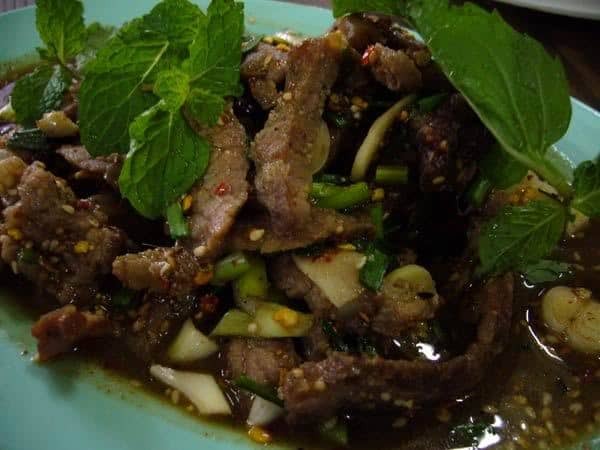 This recipe is very famous in the northeast of Thailand (“Issan”). Normally, the Thai people like to serve this dish with sticky rice balls or jasmine rice, and plenty of vegetables. Give it a try, we think you will be pleased. 1. In a bowl, mix the chopped garlic, light soy sauce, chopped coriander root, ground cilantro, white pepper, salt and whiskey, and then pour the mixture on the beef. Using your hands, cover the beef thoroughly with the mixture and set aside. 2. After 20 minutes, place in the oven about broil for about 15 minutes on each side or until done (cooked rare). 3. Remove from the oven and cut into thinly sliced small pieces. Tip: While broiling brush olive oil on the beef to keep from drying. 1. Place the chicken broth and beef in a saucepan and stir for a few minutes using a medium high heat setting. 2. Turn off the heat and let it cool for a few minutes. 4. Mix the fish sauce, lime juice, ground chili and palm sugar in a separate bowl, then pour the juice mixture in the saucepan and stir, mixing the contents well. 5. Place on a serving plate and garnish with mint leaves. 6. Serve with your choice of vegetables. Using approximately Â¼ cup of (raw) jasmine rice, heat in a small pan (while dry) using a medium high heat setting. Stir the rice continuously until brown. Remove the rice from the pan and allow to cool, and then grind the rice using a blender (with grinding blade and setting) or crush using a mortar and pestle. Note: Sticky rice may be used instead of jasmine rice to give more aroma.